Neuschwanstein Castle in Germany is not only one of the most visited castles in the entire country, but also one of the most popular tourist destinations in all of Europe. If Neuschwanstein Castle is on your bucket list, AESU can help turn your dreams into reality with one of our Affordable German Vacations. Click Here to find a trip that is right for you. 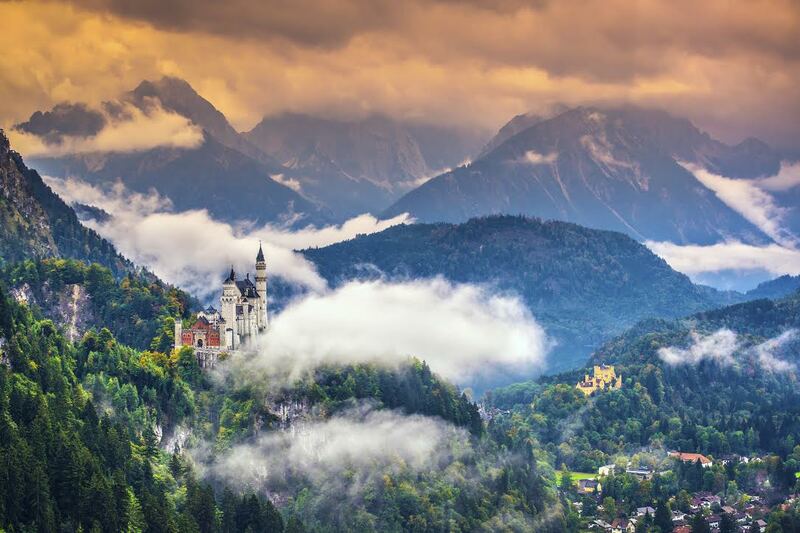 Located in Bavaria, Neuschwanstein Castle was built by King Ludwig II, also known as the “Fairytale King.” As you can probably imagine, a king with such a nickname designed a pretty whimsical castle. And because it was built in the 19th century (construction began in 1869), when castles no longer had strategic and defensive purposes, the castle’s location was chosen more for aesthetic appeal than military fortification. It is located in the Alps, overlooking the Hohenschwangau valley. Building a castle in the 19th century also had another benefit: technology. In fact, the interior is equipped with state-of-the-art technology. Well, state-of-the-art technology at the time of the castle’s construction: indoor plumbing and an air heating system. Talk about living like a king! A beautiful inner garden surrounded by a walled courtyard. The Singers Hall, which occupies the entire fourth floor, contains characters from renowned composer Richard Wagner’s operas. In fact, Neuschwanstein Castle was built in Wagner’s honor. The castle took nearly 20 years to complete and was not finished even at Ludwig’s death in 1886. Several weeks after King Ludwig II’s death, the castle was first opened to the public. Today Neuschwanstein Castle is the most visited castle in Germany, and one of the most popular tourist destinations in the world, drawing more than 1,300,000 people annually. Neuschwanstein Castle is open daily, except for January 1st and December 24th, 25th, and 31st. Want help booking one of our Affordable German Vacations? Please contact AESU by calling 800-638-7640 or fill out the contact form found on our website. And don’t forget to check out all of our great Travel Tips, especially the Travel Tips for Europe, before you head overseas. This entry was posted on Thursday, November 13th, 2014	at 4:23 pm	. You can follow any responses to this entry through the RSS 2.0	feed. Both comments and pings are currently closed.